Dr. Robert Delpresto (Brick) - Book Appointment Online! From common problems to gum disease, we provide an array of dental services to meet your needs all in one convenient location. Using the latest technology, our experienced staff works together as a team to give you exceptional quality treatment from the time you walk in for your initial visit. We thank you for your interest in our services and the trust you have placed in us. Please contact us if you have any questions. Same day emergency toothache management available. 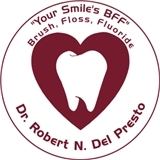 Dr. Del Presto is a graduate of the University of Medicine of New Jersey. While training there, he learned the importance of caring for the people who were attached to the teeth he was treating. Dr. Del Presto now provides a full range of quality dental services, including tooth whitening, dentures, implant placement & reconstruction, cosmetic care, root canal & periodontal (gum) care, in a relaxed atmosphere.